No new beds for patients in psychiatric crisis will be made available by the region’s mental health trust, despite concerns being raised by the health watchdog over that a shortage of beds “had impaired patient safety and treatment at times”. We haven’t found a senior doctor at Norfolk and Suffolk NHS Foundation Trust (NSFT) who believes that there are enough beds. When asked about the bed review, the most frequent response is a despairing laugh. Non-medical operational managers are putting inappropriate pressure on doctors to discharge patients the managers are unqualified to treat and have never even met. The £58,000 review was commissioned to look into whether Norfolk and Suffolk Foundation Trust (NSFT) had enough beds, after a Care Quality Commission (CQC) inspection last year lifted it out of special measures. But despite conclusions that no new beds were needed to treat those in psychiatric crisis, the number of days patients spent either in private care or outside the area was at its highest level in a year. Last week an inquest in Ipswich heard the case of Neil Jewell, a Norwich man with paranoid schizophrenia who died under NSFT’s care in 2014. There were no beds for Mr Jewell in Norfolk, nor at West Suffolk Hospital where he was originally taken. He ended up at Ipswich Hospital. NSFT has known for three years that Neil Jewell’s death was due to the unavailability of an NHS psychiatric bed for professional care and Clozapine re-titration. Meanwhile, a report is suggesting the introduction of cafes to treat mental health patients – with the first one planned for Norwich later this year. 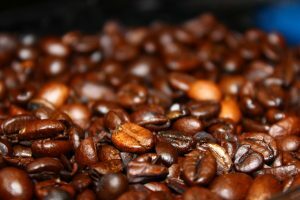 The cafes would “primarily be non-medical” and focus on de-escalation, according to a report seen by the NSFT board of directors. But they would “be supported by clinical staff”. But campaigners hit out at the plans, saying “people in psychiatric crisis needed beds, doctors, nurses, psychologists, social and support workers rather than platitudes and cups of tea”. In March, 1,107 bed days were spent either outside of the trust at the private Mundesley Hospital, or outside of Norfolk and Suffolk, at a cost of £737,000. This compared to 984 bed days in February and 328 in April 2016. Mundesley Hospital was rated as inadequate by the CQC in March this year. 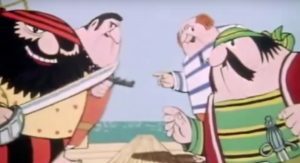 So many irrational cuts proposals contain a ‘cuts café’: it must be a standard cut’n’paste paragraph for the bureaucrats. Cuts cafés were included in the consultation proposals when they closed wards at Carlton Court near Lowestoft and at the Julian Hospital in Norwich. And it is hoped that by addressing clinical variance across the trust, the current number of beds could be sufficient. Julie Cave, director of finance and NSFT’s lead director for the bed review, said there were plans to increase bed numbers, but “these beds would not be described as adult acute crisis beds”. 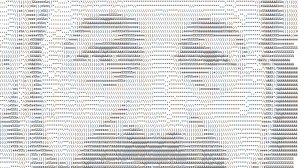 We’ve heard that the bed review is simplistic and that its results were predetermined. Who is telling us that NSFT has enough beds? Is it a doctor, a nurse, a psychologist or a mental health social worker? Is it a patient or a carer? No. It is an accountant. That tells you all you need to know about what is driving this stitch up. Money and cuts. An accountant should at least numerate. If you were to take mathematically modelling mental health seriously, one of the most important outputs would be the mortality rate. While the number of beds has been cut, the number of deaths has doubled. In just four years. People are suffering life-changing injuries or dying because of delays in admission. She added: “We cannot discuss the details of these beds any further during the pre-election period as all such announcements are on hold in this period. Total rubbish. Parliament is still sitting and so purdah has not yet begun. Asked about the target is getting out-of-area mental health placements to zero by October 2017, Ms Cave said the report had highlighted “hotspots” in certain areas, with more people being sent out-of-area. Internally, NSFT is claiming that ‘Norwich should be more like Ipswich’ and admit less patients. But Norwich CCG has a 42 per cent higher incidence of serious mental illness (SMI) than Ipswich & East Suffolk CCG, so how can it have the same admission rates as Ipswich? 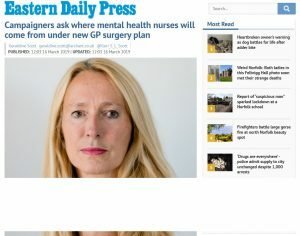 NSFT is claiming that central Norfolk NHS and Norfolk County Council teams are ‘overadmitting’ patients when the same teams are admitting fewer patients in North Norfolk CCG area than in the Ipswich and East Suffolk CCG area, despite North Norfolk having a higher incidence of serious mental illness. It is already very difficult, often impossible, to secure a voluntary psychiatric admission in Norfolk. The Mental Health Act Code of Practice is undermined if the only way to secure admission is tot be detained under the Mental Act when the patient is willing to undergo voluntary treatment. So, a deadline for the ending of out-of-area placements was April 2014, then October 2017 and is now March 2018. Can we believe a word NSFT says? 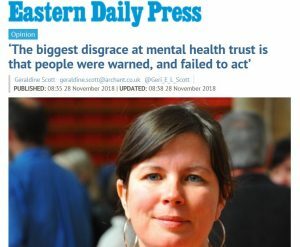 A spokesperson for the Campaign to Save Mental Health Services in Norfolk and Suffolk said: “NSFT is plumbing new depths, transporting people in mental health crises to private hospitals across the country, some rated inadequate by the CQC, in greater numbers than ever before. 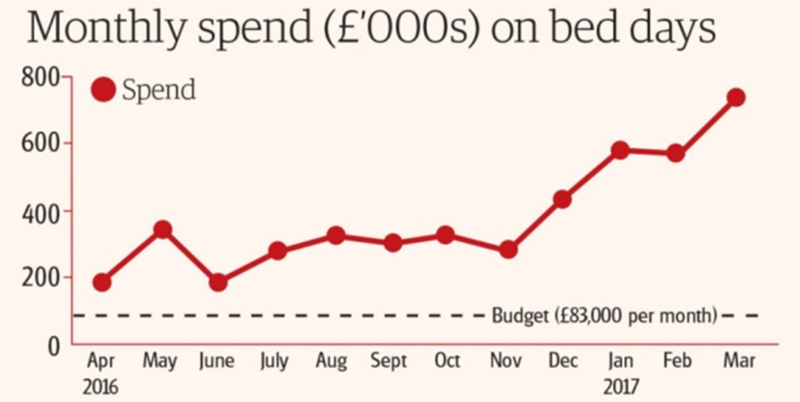 The £4.5m NSFT wasted last year could have funded at least 40 high-quality, local NHS beds. But the CQC found “there remained a shortage of beds across the trust and that this had impaired patient safety and treatment at times” and “a lack of available beds meant that people may have been moved, discharged early or managed within an inappropriate service”. However, this is contrary to the objectives of the mental health workstream of the Sustainability and Transformation Plan (STP) for Norfolk and Waveney – which is designed to find ways to save the NHS money. Norfolk and Waveney’s five CCGs jointly commissioned the beds review alongside NSFT. A spokesman for all five said: “This review has not yet been fully circulated or published and therefore CCGs are not in a position to comment in detail. “It would not be correct at this time to conclude the answer to NHS mental health service capacity lies in providing more beds. The bureaucrats are probably too busy drinking tea, eating biscuits and planning their next long-haul holiday financed by their inflation-busting pay rises to read the review they themselves commissioned. 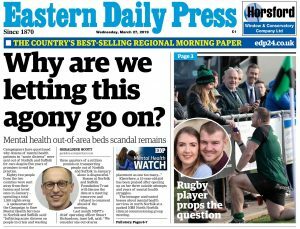 We’ve thought long and hard about why NSFT and commissioners don’t want to open new local beds but would rather waste millions at private hospitals across England. Sadly, the conclusion we’ve come to is that planning, opening and running new wards would be hard work and they are simply too lazy. Click on the image below to read the article in full on the EDP website. It is a ‘must read’. Even better, support the local investigative journalism which is so important to our campaign by buying a copy of the Norwich Evening News or Eastern Daily Press. Join us on the March for Mental Health on Sunday 30th April at 11 a.m. on Norwich City Hall steps. 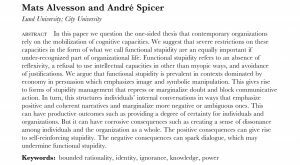 This article proves the often held view that the top level management are simply in a damage limitation mode driven by a blinkered bunker mentality. They know full well that the situation is appalling but there is no advantage to admitting this since it will cost them their 6 figure salaries. Weak, ineffectual management driven by greed and self interest, there’s your local mental health trust. Thoughts are with Neil’s family. How can NSFT have hidden behind the outrageous events that led to his death for over 3years? It happened just after the Campaign began and the Board have continuously side stepped issues raised. They only took notice of Campaign due to Monitor and our first march but that didn’t last long. Hasn’t it dawned on them that friends family and carers have tried tea? Whilst this may be beneficial to some it’s unlikely to reduce major MH incidents and reduce need for beds. I am not an accountant but I can add up. It’s cheaper to open more beds. Look at the increasing population. It is obvious-just open more beds! I agree, people are suffering life-changing injuries or dying because there is not enough clinically led hospital treatment. The Trust use the excuse that bed blockers, (that is people who are well enough to leave hospital) do not have accommodation to go to on discharge. However, this is a continuing issue which affects acute as well as mental health hospitals. The implies the Trust needs more beds to accommodate BOTH those in urgent need of clinical care as well as those who are stuck in its beds until suitable accommodation and support in the community are found. People who have enduring mental health conditions will always have times when their condition needs regularising. The horrendous rise in unexpected deaths is due to a gradual build up of people whose conditions have deteriorated, due to historical mismanaged redesigns of Trust services, overworked staff, not enough staff, and insufficient beds. Again I ask when are people in power going to recognise this mortal injustice suffered by those who so often cannot articulate and fight for themselves? I am ahamed to be a member of a society which allows this to happen. (1.148/0.805 – 1) x 100 = 42.6% higher incidence in Norwich than Ipswich and East Suffolk. I’m pretty sure that 99 out of 100 people admitted are sectioned to a bed…..How on God’s earth is a cafe going to help anyone sectioned…..I’m guessing that all those poor people sent out of area were under a section of the mental health act…..They needed a bed, not a cafe……ridiculous, and incredible decision making…There’s been 140 bed closures, countless tragic deaths, and untold suffering….I can only compare the board to Nero playing on his gold fiddle, while Rome burns. Disgusting. I’m not allowed to drive. How will a cafe in Norwich, 40 miles away, help me when buses stop running at 8pm?